n 2014, five guys got together with an idea to build a company that would revolutionize sleep. To create an affordable, direct-to-consumer mattress—without the need for stuffy showrooms or sleazy salespeople. While their co-founder’ backgrounds certainly helped their initial growth, much of it has come from their innovative approach to marketing. I recently spent a month reverse-engineering their funnel, from top to bottom. And in doing so, I found 14 killer marketing strategies you can use to get more engagement and higher conversions for your site. Below are 14 strategies Casper used to grow their company. Not all of them will be relevant to you. That’s a given. So, to save time, I’ve added a table of contents so you can jump to the strategies that interest you most. It’s how you capture the biggest market share and become a household name. And, how you build your strategy around your competition’s weaknesses. Buying a mattress was once a complicated affair. First, you had to browse several furniture stores to compare prices. Then, you had to choose a type of mattress (open spring, pocket spring, etc.). More, you had to test its firmness depending on your preferred sleeping position, height, and weight. Next, you had to choose an appropriate size (single, double, king size, etc.). Finally, after making a decision, you had to negotiate with a pushy salesperson trying to upsell you. Once bought, you had to guide the delivery man through your home, praying he wouldn’t damage your new mattress before setting it down. Today, it’s a VERY different experience. While buying a mattress in-store is still common, Casper has reinvented what it means to buy a mattress. Gone are the days of awkwardly lying on a mattress in front of a salesman and then waiting around all day for a delivery. Casper’s reinvention of the buying experience runs throughout their marketing, beginning top-of-funnel with their Google search ads. Our strategy from the start has been to change perceptions about mattress shopping and create a community around sleep in a playful and creative way, with a genuine voice. Casper has reinvented the buying experience by capitalizing on the “mattress in a box” concept, a trend that’s seen a steady climb in recent years, particularly in the United States and Canada (more on that shortly). Buying a mattress in a box is exactly as it sounds. Once it arrives, you remove the mattress from the box and set it on your foundation while it’s still encased in plastic. Then, you remove the mattress from its plastic wrapping, give it 45 minutes to an hour to regain its shape, and you’re ready for a good night’s sleep. Similar to companies like Apple, Casper has transformed something as mundane as unboxing their product into a memorable, share-worthy experience. In fact, they even go as far as encouraging you to document your unboxing experience on their frequently asked questions (FAQ) page. Unboxing, in and of itself, is another trend Casper has capitalized on, given its increased interest in recent years. Casper’s unboxing videos are so popular, they have millions of views on YouTube, alone, resulting in free publicity for the company. When you reinvent the buying experience. People pay attention. Imagine, for a moment, you’re in a pet shop and your child is begging you for a puppy. Unsure whether it’s a good idea, you say no. Secretly hoping that your child will lose interest by the end of the weekend, you agree to take the puppy home. Most of the time, you turn out to be right. The child does lose interest in the puppy—but you fall in love with it. By Sunday night, you want the puppy more than the child does. Ding. Ding. The puppy-dog close, as it’s known, is one of the most effective closing techniques in the book. And, unsurprisingly, one Casper leverage throughout their marketing, notably with their unbeatable guarantee. For each of their mattresses, Casper offers a risk-free 100-night free trial. The promise? If you decide Casper’s mattress isn’t for you, they’ll send a courier over to remove it from your home and either donate it to a local charity or have it recycled. Best of all, you don’t even need to have the box. Casper isn’t just focused on making money; they’re interested in helping those in need and doing their part for the environment. This resonates with millennials, especially, who consider charity and the environment key deciding factors in their purchasing decisions. There’s also a secondary benefit to offering a 100-night free-trial. Casper knows that once a customer makes the product a part of their everyday life, whether they know it or not, they’re far less likely to return it. As mentioned above, Casper’s 100-night free trial isn’t something casually mentioned as an afterthought (such as on their checkout page). Rather, it’s something that’s consistent through each stage of their funnel (especially in their cart recovery emails which we’ll discuss in Part 5: Strategy#1). Action Item: You probably already have a guarantee for your products. But is it unbeatable? Is it one that your customers love you for (and your competitors hate you for)? If not, consider lowering the barrier to entry so that your offer is too good for prospects to ignore. Casper leverage three content archetypes as part of their strategy, each with the goal of nudging prospects further along the purchase funnel. Much of their To-Fu content is short-form and humorous, whereas others, as we’ll see in Part 3: Strategy #2, is well-researched. Interestingly, rather than ask for an email address on these pages, Casper incentivize you to submit a survey about your sleeping habits, offering a $25 discount as a reward. In it, they ask questions about your preferred sleeping position, your evening routine, as well as general demographic questions about your age, income, gender, and more: . At the end of the survey, they ask for your email, before offering you a coupon code. Answering their target buyer’s most pressing questions increases Casper’s organic footprint in the SERPs and positions them as a market authority. Surveying visitors that have come from specific search queries gives them a highly-targeted focus group and feedback so they can improve their marketing. Offering a discount, front-end, to a visitor who came from organic search fast-tracks impulse buyers without the need to pay for traffic (more on that in Part 4). Action Item: Using sites like Quora and Reddit, research your target market’s most pressing questions and create content that answers those questions. To learn more about how to do that, step-by-step, read this article. A common obstacle to buying something, like a mattress, is not knowing which is right for you. As mentioned above, there are lots of considerations such as the type of mattress, its size, its firmness, and more. Casper help potential buyers overcome confusion with their mattress size comparison guide. And, for keywords that it doesn’t rank position #1 for, it ranks for featured snippets (also known as Position #0). For example, for “queen size bed dimensions in feet,” they rank position #6 (at time of writing), but rank for a featured snippet, stealing 8.6% of all clicks in the process. What’s interesting is, rather than ask you for feedback on this page, as they do for their To-Fu content, Casper invite you to enter a competition. It’s clever. A visitor who is comparing mattress sizes is likely further along the buyer’s journey than someone who is searching for sleeping aids. So, Casper asks for an email, rather than feedback, and introduce their products in their onboarding emails (more on that in Part 5). Action Item: If you sell different types of product (e.g. cosmetics like foundation), create a comparison guide that helps buyers find the right one for them. Bonus if you can rank it well in the SERPs. You know the importance of using customer testimonials to help close potential buyers. But are you showcasing them as best as you can? Knowing the importance of reviews in a competitive market, Casper showcases all their reviews on one page on their site. First, they feature written reviews by their customers, including the person’s name, where they’re from, and how they rate Casper. Beneath their customer reviews, you can read tweets from customers, adding further to the legitimacy of their reviews. Finally, Casper adds the third layering of social proof: media badges and press mentions. There’s a reason why Casper go to such great lengths to optimize their review page and we’ll discuss why in Part 5: Strategy #2. Action Item: It’s common for online stores to have their reviews on third-party sites. But that doesn’t always mean its a best practice. Take your best reviews and have them on one page on your site so you have more control over how you market your business. As of writing, Casper has 148k backlinks from 5.54 referring domains. It’s impressive, but unless you have a multi-million dollar marketing budget, few of their link building strategies are replicable (if you’re curious, I’ve included my three favorites in the bonus resource). So, rather than explore the unreplicable, I want to show you three unconventional ways Casper build links and how you can, too. Take a look at Casper’s referring domains. If we refine the search, we can see they’ve built twelve do-follow .edu links using, what I call, the college student discount (CSD) method. So, what is Casper doing to build these links? On it, students can get discounts from a range of products and services including apparel, insurance—and mattresses. Coincidence? Maybe. But probably not. Here’s another example from The State University of New York, again, with a page discounting products and services for students. If you scroll down, they, too, have a discount on any Casper mattress. While it’s impossible to know if Casper actively sought out these links and others, it’s highly likely, given the frequency of these type of links—and the PageRank they pass. Action Item: It’s easy to assume building links like the above is impossible. But many sites, like CSUN, have a form where you can submit discounts of your own. Ask yourself, “Who else can I serve?” Then, consider where that target market hangs out and reach out to the right sites. In Section #2, we discussed the three content archetypes Casper use to generate search traffic. You also learned one of those archetypes was content that answers your target market’s questions. Casper does a fine job of doing that. But, sometimes, answering a question goes beyond giving an opinion. In truth, to become an authority on a subject, you often need to cite, or even better, publish original research. In it, Casper debunks an industry myth about how often you should change your mattress. Rather than cite other people’s research, they use their own findings having researched their own mattresses, and set the record straight. Content doesn’t always have to be published on a blog for it to acquire links. Action Item: If you’re creating content for your site, consider publishing original research (even if it’s a meta-analysis of other studies) Yes, it takes time. But it can also be an asset for sites in your marketplace to link to. One of the quickest and easiest ways for online retailers to build links is to get featured in best-of content—content that curates the best of the best for a niche. (I call it “the best-of backlink builder”). In fact, Casper has acquired several do-follow links from several high-authority sites like The Knot (DR:90) and Brides (DR:82) using this very strategy. Now, here’s where it takes an interesting turn. But upon closer inspection, it’s actually an affiliate link. The best part about getting featured in best-of content, of course, is it’s scalable. Action Item: The Best-Of Backlink Builder is a killer strategy if you sell products that are good gift ideas. Using search operators like “best [keyword] gifts” and “[keyword] gifts for [gender],” identify sites that could include your offer. Then, reach out to them. Yes, it’s time-consuming. But it’s a great e-commerce link building strategy. Like many multi-million dollar companies, Casper invests a fortune in paid advertising. In fact, as of writing, their estimated monthly budget for Google Adwords, alone, is $128,000. (Source: SimilarWeb). But that doesn’t mean their strategies can’t be modelled on a smaller scale. Here are my three favorite strategies I found while researching. A good marketer knows which countries are driving the most traffic to their site. Using a tool like SimilarWeb, we can see the majority of Casper’s traffic comes from the United States, the United Kingdom, Canada, France, and Germany. So, it makes sense that Casper advertises to users in the United States, the United Kingdom, and Canada in English. After all, for the US and the UK, (and 56.9% of Canada), English is the mother tongue. But what about countries like France and Germany where English isn’t the first language? Casper is growing their market share in other countries by translating their ads into the target country’s first language. Take, for instance, the following display ad, shown to German visitors who have previously visited Casper’s site. When clicked, users are taken to a landing page with German copy and customer support. If you try to leave, Casper shows an exit-intent popup asking for your email address. Translating ad copy into a target market’s language personalizes your marketing. Offering customer support helps readers overcome objections to buying (more on that in Strategy #12). Capturing abandoning visitors’ email addresses gives you an opportunity to remarket using another media (like email). Action Item: Log into Google Analytics and click, “Audience > Overview > Country” to identify your audience by country. Then, consider translating your ad copy into the mother tongue of one or more of those countries. If you’re using Google search ads to grow your business, you know that you can’t have more than one search ad that sends visitors to the same site at the same time. But that hasn’t stopped Casper from monopolizing their most profitable keywords. Take, for instance, “casper mattress reviews,” a search query we discussed before. Here’s what I see when I Google that term. Notice anything interesting? Casper dominates three out of four of the ads, directing visitors to Amazon, Google reviews, and, of course, their site. They’re all online retailers which sell their products. Further, they have a Google Shopping ad to the right making it near impossible to ignore them. Action Item: This strategy is advanced. I’ll grant you that. But if you can pull it off, and your products are available on other sites, consider sending visitors to them beyond your own site. You’ve probably experimented with Facebook Advertising. And if you have, it’s likely you’ve experimented with remarketing using native advertising. But have you ever tried both simultaneously? Casper has. In fact, it’s something they’re doing to win new customers. First, Casper advertises their brand to new audiences using a Facebook Ad. In it, they entice users to click-through using a curiosity gap (“What is the social unboxing phenomenon, and why is it taking over the Internet?”). From there, Casper sends users to a CBS article praising their brand’s positioning. If you are, I pondered that, too. Action Item: Look for a site that (a) praises your brand and (b) allows ads or sponsored links on their site. Then, experiment with driving traffic from Facebook to that site and track the number of referrals through their site’s ads. Like many online retailers, Casper sends a variety of marketing emails. Here, I’ll focus on three specific email strategies they’re using to move prospects through their funnel. 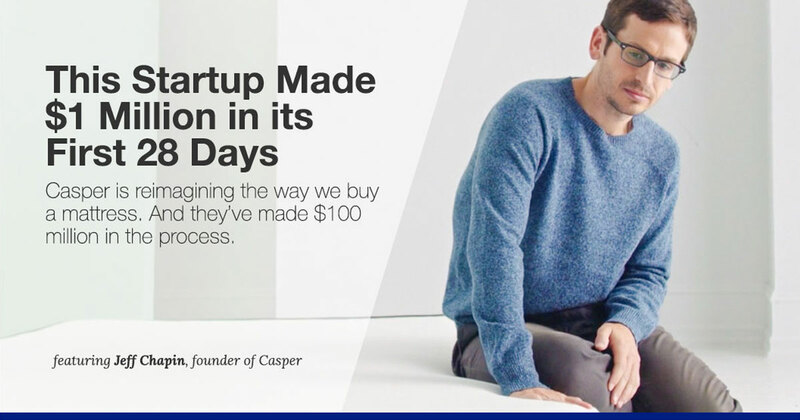 Casper leverage a clever 2-step cart abandonment process for recovering on-the-fence buyers. When I abandoned my cart, I received the first of two cart recovery emails a day later. In it, Casper invited me to complete my purchase. Nothing new there. But beneath the call-to-action, was a GIF, highlighting frequently asked questions, and an invite to get in touch if I had any questions. Inviting abandoning visitors to reach out isn’t just an example of great customer service, it’s also a great way to overcoming potential objections that weren’t addressed on a prospect’s first visit. Further, Casper give several ways to get in touch, making it as easy as possible for you have your questions answered and complete your order. I chose not to return to my cart. So, a day later, I got a second email. In it, Casper emphasize the unbeatable guarantee we saw in Strategy #1, making it as easy as possible for me to complete my purchase. You might not be able to compete with your competitor when it comes to free shipping, 3-month guarantees and other expectations consumers have. But, you can take what makes your business unique, and remind prospects again and again. Action Item: If you own an online store and send cart recovery emails, give prospective buyers an opportunity to contact you. Then, help them overcome any objections they have so they can move forward with their purchase. If you read my post on Harry’s Marketing, you know Harry’s got 100,000 email addresses in seven days—before they made a single sale. Casper has built a similar referral engine into their marketing, post-purchase, inviting customers to refer friends. In the email footer, there’s a referral link to refer friends and earn rewards. This creates a curiosity gap. The rewards aren’t specified, so you’re enticed to click-through and learn more. When you click “Learn More,” you’re redirected to a page on Casper’s site where you’re offered an Amazon gift card in exchange for each referral you make. They make sharing super simple, depending on your preferred media. For instance, if you click “Email,” Casper trigger a prewritten email so you don’t even have to write the message yourself. It saves you time, and it’s a great way to simplify leaving a review. Action Item: Your customers are your greatest salespeople. So, invite them to refer others—and incentivize them for doing so. You might not be able to refer Amazon Gift Cards (few can), but you can offer them something (e.g. a discount on a future purchase). As mentioned above, Casper uses their order confirmation emails to invite new customers to refer friends. In the beginning, while building their authority in their marketplace, Casper built their reputation through asking for reviews. A few days after becoming a new customer, Casper would invite you to leave a review on their site. After clicking the call-to-action, you would have been redirected to Casper’s review page. On it, Casper would have invited you to leave feedback using several questions as prompts. Casper knows consumers tend to write generic reviews when asked, so, back then, they guided customers to write about areas important to them (Casper). This included the unboxing experience and whether the customers would recommend Casper to a friend. Casper has hundreds of reviews that meet all of the above. No amount of copy you write will ever outperform praise from a customer. So, use glaring reviews in your emails. And use them often. Action Item: Invite new customers to review their purchase after enough time passes. Then, guide them on what to say, based on potential objections to buying your product or areas you want to highlight. Finally, repurpose those reviews throughout your marketing. My advice? Choose one, invest time implementing it, and then, if possible, make it even better. Which of Casper’s marketing strategies will you try first? Are you going to try “The CSD Method”? Or are you going to translate your ads to capture new markets? Leave a comment below.